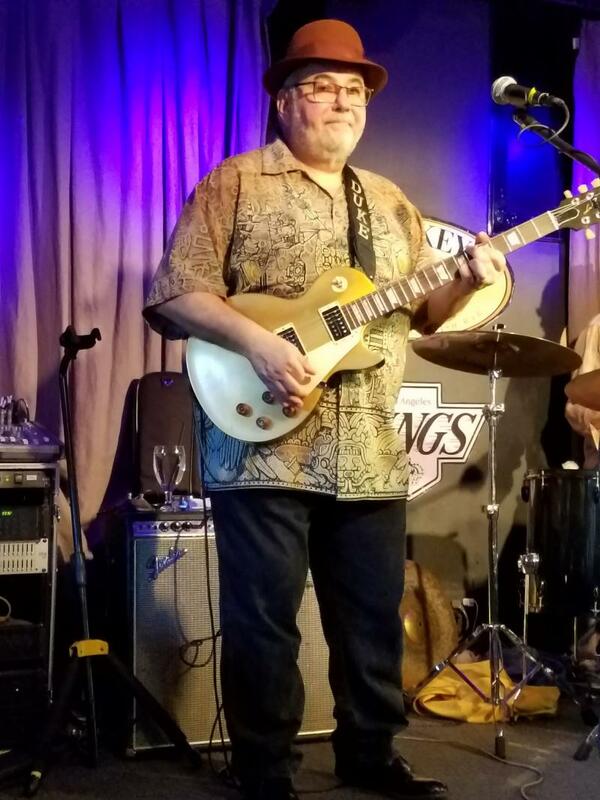 On Sunday, March 26, The Duke Robillard Band performed in front of a jam packed crowd at Malarkey's Bar and Grill in Long Beach as part of a seven stop California tour. It is always a treat when the great Duke Robillard and his band make it to the other side of the continent for some gigs. It has been a few years now since the the Rhode Island native and long time resident of that New England state performed here in California. There was a time when we would get a Duke sighting once a year at places like The Blue Café, Café Boogaloo or Cozy’s here in Southern California, which would be packed with Duke Heads, admiring musicians and just plain folks crazy about great music. All of these places would book “nationals” on a regular basis, but are now long gone, as are many of the traveling blues musicians who would visit us out here. In the interim, between California visits, Duke continued to pour out one or two albums a year exploring various vintage musical dialects...mostly blues. He remains a first call sideman, where his special guest slots on guitar are often an album highlight for other people’s projects. He is also an in demand producer. 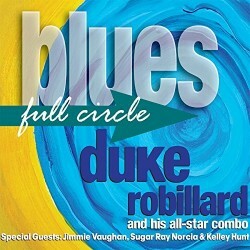 His most recent album, 2016 Stony Plain Records’ Blues Full Circle contains original artwork by Robillard on the cover and blues in the grooves. It is filled with fiery impassioned musicianship from Duke and his band. They are drummer Mark Texiera, bassist Brad Hallen and keyboard player Bruce Bears. On Sunday, as is the case with all of Duke’s performances, he was backed by this trio of wonderful musicians. They represented a perfected unit who could travel in any direction that the boss might take them. While a set list remained at the feet of the musicians on Sunday, it became apparent early on that Duke would eschew any such formalities and would follow his own muse. He pulled selections going all the way back to the second Roomful of Blues album, 1979’s Lets Have a Party to material off his latest, 2016 release and lots in between. He closed the first set with the T-Bone Walker classic, T-Bone Shuffle. After a short intermission, Duke and the band began to play some straight ahead jazz. The audience responded very favorably to this new direction, which allowed the band to demonstrate not only their versatility, but some very impressive chops in this closely related field. Duke’s affection for jazz goes way back and as recently as 2011 he put out a jazz record entitled Wobble Walkin’ which was billed as the Duke Robillard Jazz Trio. This release, on Duke’s own Blue Duchess Record label, is not to be overlooked in the vast pantheon of Duke’s recordings. The band really dug in at this point in the evening and thrilled the audience with their fluidity and extensive jazz vocabulary. They truly separated themselves from the pack when they brought this side of their repertoire to bear. For Duke’s part he spoke in the language of Barney Kessell and Herb Ellis. The latter with whom he recorded two albums at the turn of the millennium entitled, Conversations in Swing Guitar and More Conversations in Swing Guitar. As the evening came to a close, Duke brought up Kid Ramos to join the band. It was Ramos who invited Duke to be part of his great 2000 album, West Coast House Party, so these two go way back. Those who only know Ramos as the Telecaster slinging blues man, would have been in for the surprise of their lives as he picked up a Gibson ES 335 and began to trade jazz licks with Duke. The two engaged in some wonderful interplay on Kenny Burrell’s Chitlins con Carne, before ending the evening with more traditional blues faire and the Albert Collins’ instrumental Backstroke. This is where one might expect Ramos to grab his "tele", but instead he coaxed incredible Albert Collins tone out of his Gibson. Even though there were a lot of musicians in the house, some of whom are quite accomplished, it was great that they didn’t force themselves onto the stage and turn this very special evening into just another ego driven jam/cluster f*ck. Ramos’ inclusion was perfect. It was great to catch up with the Duke Robillard Band here on our own home turf. Hey Duke…don’t be such a stranger. You are always welcome to swing by anytime.